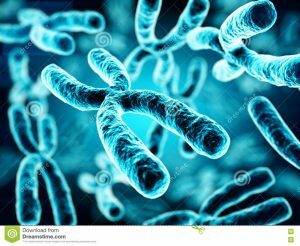 The secret of who we are lies in DNA (DeoxyriboNucleic Acid). It is a long molecule in the shape of a rope ladder that is coiled tightly like a spring. It is small enough to fit in the nucleus of every cell of our body, and it contains all our hereditary qualities such as body shape and skin colour, the number of our teeth, the predisposition to learn language and develop cancer, certain character qualities, and so on. ATGCGGACCTCCCTC, at the other side they will be TACGCCTGGAGGGAG. Genes are in fact much longer, containing thousands of AT and GC couples. The number of possible combinations is infinite, but each gene has its own particular combination. From the moment of conception, each gene sends out a chemical message to the cells of the growing body to do certain things. 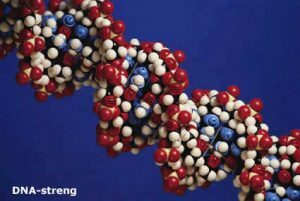 Genes work together and also against each other to create a heart, lungs, fingernails and brains. Genes contain the information that is typical for the species: thus a cockroach develops differently from a fish and a bird from a human. Genes are extremely small: about one hundred thousandth of a millimeter. Humans have about 30,000 different genes. Together they are called ‘the human genome’. Recently, scientists have identified the human genome. Our genetic material is stored in every cell of our body: one drop of mucus from the inside of someone’s cheek is enough to determine whether he is the father of a certain child or the same person who lost a strand of hair at a murder site. Since the seventies, scientists have been able to change heredity by taking individual genes and placing them into the cell of a different living being. This is called genetic engineering.